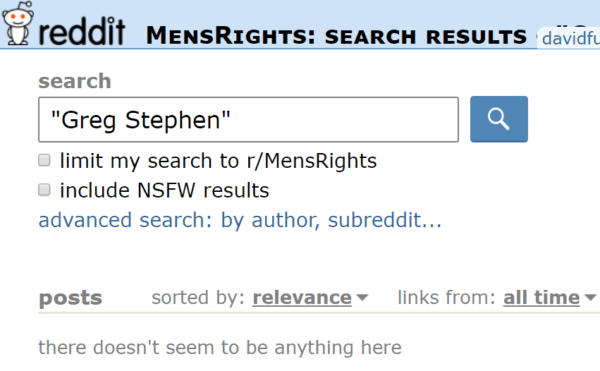 Search Results for "men's rights"
Yesterday, “Crying Nazi” Chris Cantwell was booted off of Gab for making just a few too many threatening comments about leftists. In recent days, Tucker Carlson — the whitest of Fox News’ many white supremacists — has taken a break from calling immigrants “dirty” to focus again on one of his other favorite topics: How gosh darn unfair the world is to men, especially white ones like him. It’s been clear for some time that YouTube philosopher-thing Stefan Molyneux is a huge racist. But until recently, he’s tried to be a little bit coy about it. The Washington Post caused a bit of a stir on the internet today with an article by two academic researchers offering some rather intriguing evidence suggesting that many men turn to Trump because his blustery assertions of manhood help to reassure them about their own masculinity. Let’s see: Trump is launching trade wars with our allies while effusively praising a murderous dictator for signing a meaningless document; immigrant children are being forcibly separated from their parents and kept in literal cages; Trump let thousands die in Puerto Rico because they’re brown people who can’t vote in presidential elections; and, oh, I could go on forever. Every day under Trump is a horror and an embarrassment.